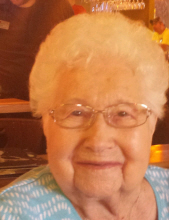 Jane L. Reiter, age 98 of Rossford passed away Wednesday February 6, 2019 in Orchard Villa Care Center, Oregon surrounded by her family. She was born in Maumee on August 31, 1920 to John and Alfreda (Schramm) Willbarger. She worked at the former Rossford Ordnance Depot during WWII. She was a volunteer at the Eleanor Jennings Adult Day Care and was secretary of T.O.P.S. (Taking Off Pounds Sensibly) at the Rossford Senior Center. She enjoyed bingo and going to the casino, but most of all she enjoyed her grandchildren and great-grandchildren. The widow of Stanley “Fuzzy” Reiter she is survived by sons Tom (Fran), Mickey (Shawn), Gerald (Cathy) and Scott (Peggy) Reiter; 10 grandchildren; and 18 great-grandchildren. To send flowers or a remembrance gift to the family of Jane L. Reiter, please visit our Tribute Store. "Email Address" would like to share the life celebration of Jane L. Reiter. Click on the "link" to go to share a favorite memory or leave a condolence message for the family.